Bodrum, a quick one-hour flight from Istanbul, is located on the southwest corner of Turkey on the Aegean Sea. The city of Bodrum lies in the center of two peninsulas, which means an abundance of beach resorts and gorgeous vistas. 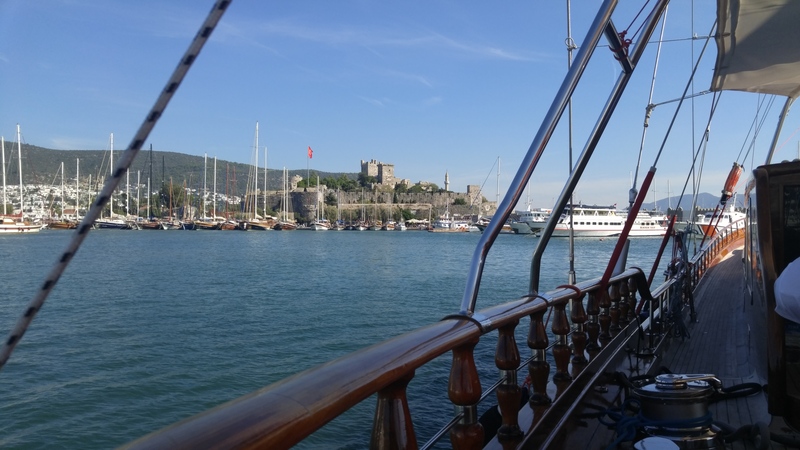 Near the marina is The Bodrum Castle of The Knights of St. John — a medieval fortress and home of the Underwater Technology Museum. The Castle was built partially with stone from the Mausoleum de Mausolus (one of the Seven Wonders of the Ancient World). 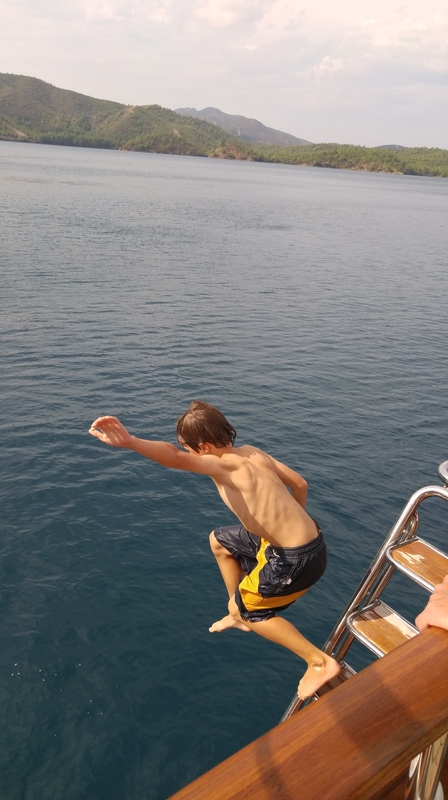 As it turns out, Bodrum is only 7 nautical miles to the coast of Greece, and is also a haven for desperate Syrian families trying to find a safe home. This creates a complex geographical situation for both the people of Bodrum and the Syrian refugees. 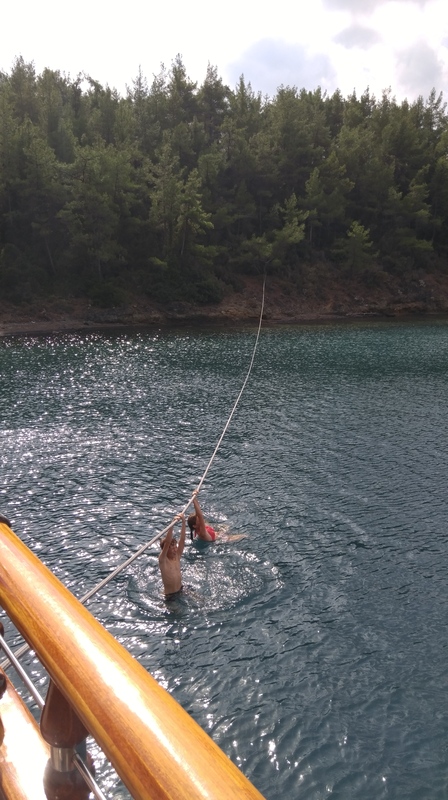 The townspeople sold life vests and rafts in their shops, while the Turkish Coast Guard was tasked with scouring the seas to maintain migrant safety. The crossing is treacherous and not always successful for these families. Some never make it across. Though we never witnessed firsthand, we understood that some are rescued in the water, which is a no-man’s land between two countries who are not prepared to accept them. It is a harsh reality and painful to witness these good people (men, women and children) in their struggle for a secure and safe home. Seeing photos and TV clips of Syrian refugees does no justice to seeing them and their heartaches first hand. When Syrian children knock on the windows of the car begging for spare change, one’s heart breaks a thousand times. (… both school time and free-time involve discussing of current events). 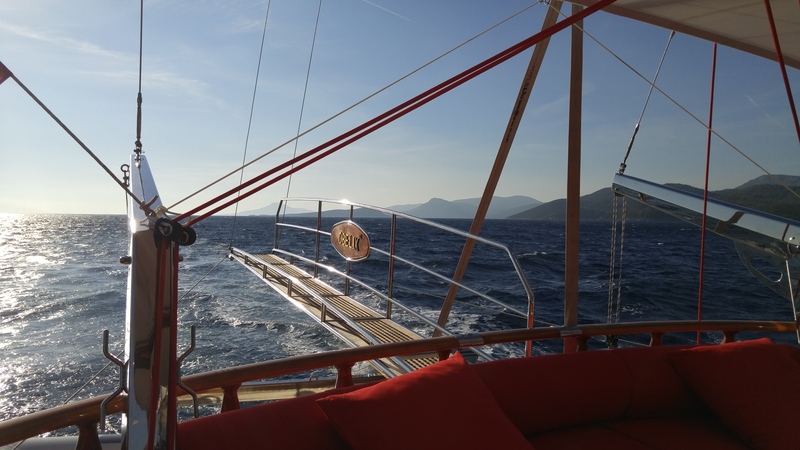 We boarded the sleek and elegant OBELIX in the Bodrum marina and soon after set off to the East to meet up with Ergin, our host. 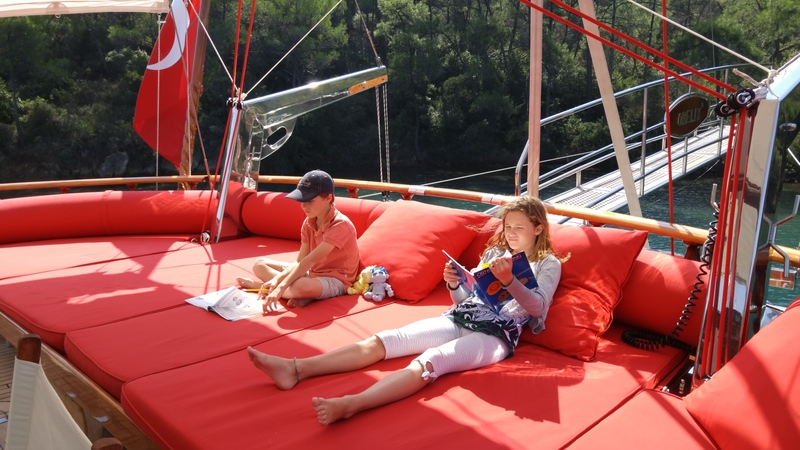 We spent 4 days on the Obelix, moving about from cove to cove. 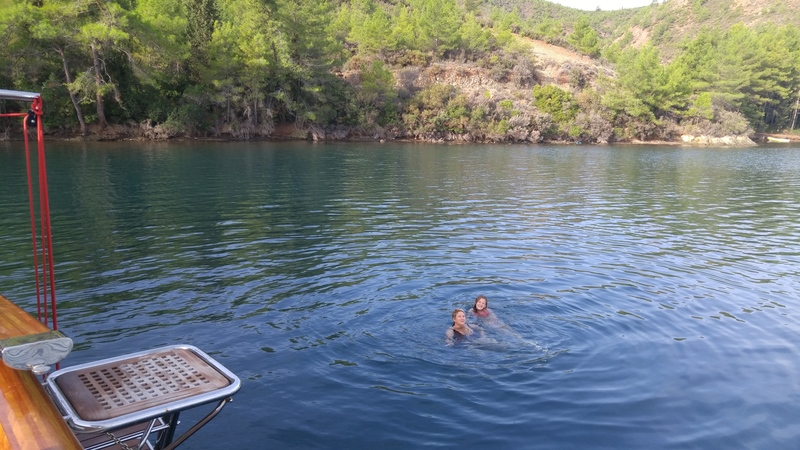 Enjoying delicious meals together and swimming every day in the crisp, clear and super-salty Aegean Sea. 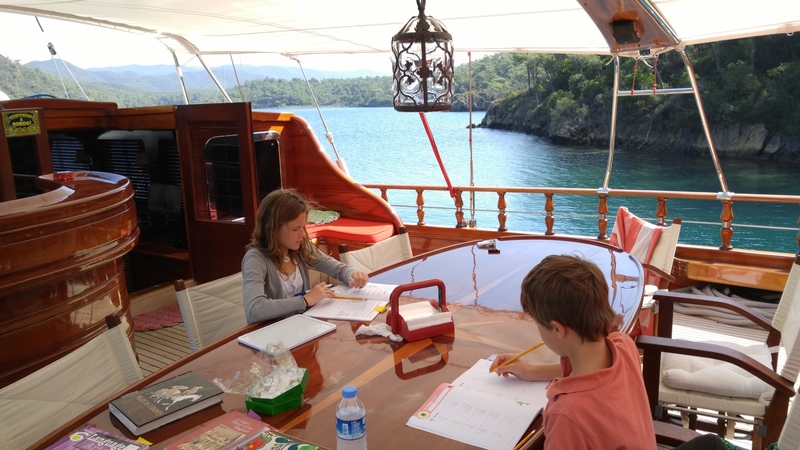 The kids loved playing on the anchor lines of the Obelix, a gorgeous 105′ Turkish Goulet. The water was brisk and felt amazing. Drying off in the warm sun and napping was inevitable! Apparently, the whole area is littered with ship-wrecks and under-water cities from the Roman era. So many, that excavations are forbidden as the country does not have the time, man-power, nor resources to safely explore the undersea treasures. So instead, they protect them for future times. The OBELIX was a perfect place to catch up on some core school work which we purposely neglected in Istanbul. Each day, after our morning family-swim, the kids and I would get out the math, critical thinking and language arts. 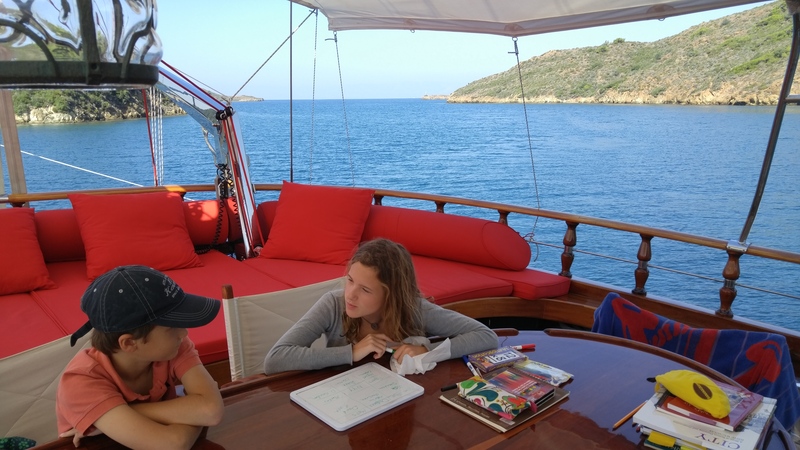 We had minimal internet on the boat, so our workbooks and manuals came in handy. We also read A LOT. To have class time on a boat like this was a dream. The quality time with Ergin and Kamal was special indeed and at a time when there is mass uncertainty in the Muslim world, we can only hope that places like Istanbul and Bodrum will remain peaceful and unaffected. Next Post Plan? What Plan.